Lerus Training Center offers several Offshore and Floating Crane Operation programs designed for the inexperienced individual who wants to become an offshore crane operator or the experienced operator who needs certification or re-certification. Courses is designed to give personnel knowledge, understanding and skills within various subsea and offshore crane operations. Crane operators are some of the highest paid operators in the different equipment operation occupation. 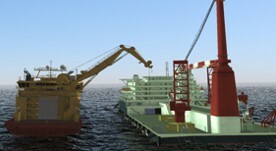 Certified crane operators are also in high demand throughout the Offshore Industry. Our crane operator training teaches people how to operate a variety of offshore cranes along with subjects such as: Crane Set-up, Wire Rope, Load Dynamics, Lift Planning, Load Charts, Rigging, and Signaling. Graduates of these programs are tested and certified on the written and practical exams on the end of education.